Last week we met our contractors for the first time and they kept on asking us questions we had not yet thought of. One of the many was about the kitchen flooring. They recommended "epoxy" but before we said yes I, the tireless researcher, thought we better did some research before confirming our choice. This decision unexpectedly triggered a chain of field trips, meetings, findings and surprises that kept us busy for the week. It is applied in multiple steps. 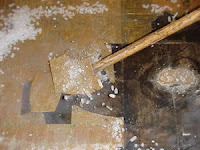 First a resin is painted on the floor, then quartz is broadcast into the resin. The dry quartz then soaks up much of the resin that would otherwise soak into the floor. After it cures, an epoxy is painted over the quartz. Pros: it is highly resistant, hygienic, exceptionally durable and soft on the feet. Cons: it is quite expensive compared to the other options, it chips so it needs to be replaced periodically, it could be slippery and the biggest con of all, it requires a very long time to prepare both the surface and each layer, and extremely skillful labor, quite scarce here. 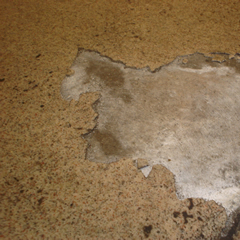 It is usually made out of natural clay and applied to the floor with a troweled-on cement based mortar. Pros: it is comparatively inexpensive and easy to install, can be individually replaced and readily available. Cons: it is very hard on the feet, it is a porous material so can easily grow bacteria (specially in the grout joints), it breaks quite easily both under impact or as water eventually goes through it and the grouts are very difficult to keep clean as grease, water and food particles get trapped. 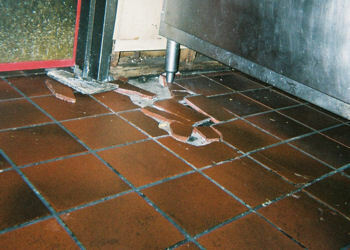 This is a finished flooring material used primarily in commercial and institutional applications. It is made up of a mixture of polyvinyl chloride and plasticizers pigments are added for color. Vinyl flooring is usually flexible, fine textured and appears to be relatively non-porous. 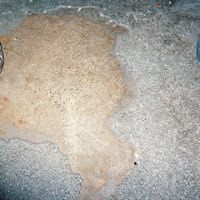 It is applied to a smooth, leveled sub-floor using a specially formulated vinyl adhesive that remains tacky but does not completely dry. Pros: it is soft on the feet, it looks good when new and is cheap. 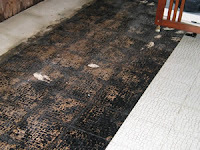 Also it is quick and easy to both install and clean and it has high resilience to abrasion and impact damage. Cons: it does not work very well at all under wet conditions. 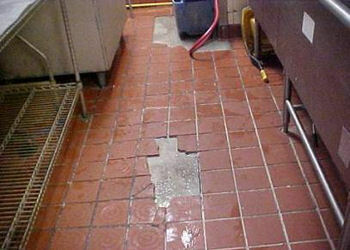 Almost always, the water gets underneath and the floor starts coming off. 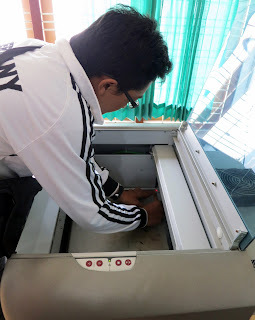 Lost in these lists of advantages and disadvantages, we decided we needed to better understand our options in Bali so we visited several professional kitchens around the island to see what they were using and get their opinion. The outcome was a myriad of advice. Our decision would change every time we ended a conversation or faced the disturbing truth of a wrong choice. Will keep you posted on our decision but as you can see, there is never a dull day in our adventures in Bali. 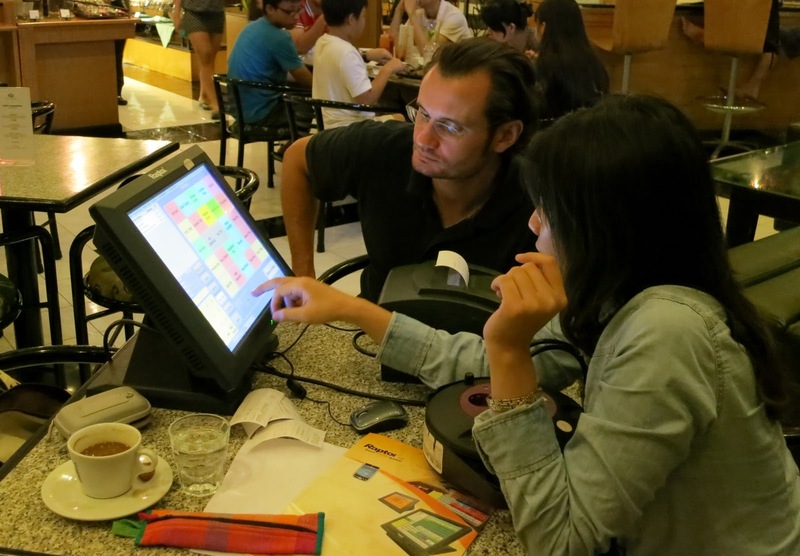 While regular cash registers used to be acceptable, it seems that a restaurant cannot longer efficiently operate without a Point-of-Sale (POS) system, a must in today's technologically advanced world. We recently decided it was time to start checking our options for POS and understanding their prices so we have met a few suppliers who briefed us on their respective systems. Basic systems are commonly offered in restaurant packages and usually are a combination of hardware and software. They typically include: a touchscreen monitor to enter data (for example customers’ orders), a receipt printer, a cash drawer, a reservation system, kitchen printers, wireless tableside order-entry devices, etc. Beyond serving as a method for collecting payments, POS systems also help track sales and inventory and streamline the accounting process. For example, if you start the day with 50 bottles of beer, after entering customers’ orders of 40 bottles, the system will alert you that the restaurant is low in beer stock so you know when you need to order more. Furthermore, they are a powerful communication tool between the dining room and the kitchen. After the waiter has entered a guest’s complete order, he can then transmit to the kitchen, through the POS, the timing on when each dish needs to be served. Premium features are really smart. For example, nowadays POS can split bills, get instant pairing recommendations to help upsell, reward repeat customers, alerts for customers’ long waiting times, etc. This week has been heavily loaded with meetings and trips to search for suppliers. Kevin was delighted because he misses the action of the kitchen so coming and going to meet many people is the closest to hectic activity he can get for now. One of the main missions of the week was to understand our options regarding audio systems. The biggest challenge for Cuca is to be able to play music at different volumes in the several spaces we have designed. Each of them must offer its own rhythm and tempo and we wanted to differentiate the experience not only with a well-defined space but also with the appropriate lighting and music level. We were relieved to find out that this was definitely possible thanks to dedicated space control devices. Another goal we need to achieve is even sound coverage within each zone, not so easy when one setting will not work in all areas as each has very different properties, especially in outdoor spaces like our garden patio. Furthermore, all the equipment will have to be chosen taking into account the different time slots of the day / night, the type of music, the player we select, the location of the controls, etc. There are many, many decisions to make along the way but we believe we found the right professionals to guide us through this journey. We have also been introduced to the power of laser. 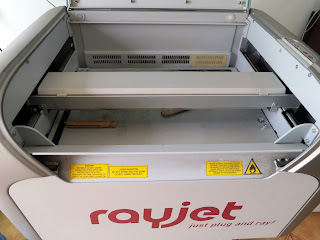 As you know, we can find lasers everywhere: in CD players, dental drills, speed measurement, for tattoo removal, hair replacement, eye surgery, etc. But at this moment in our lives we are interested in laser engraving. This technology, facilitated by a computer, consists on converting the beam of a laser into heat and delivering this resulting energy to change the surface of the material under the focal point. It may heat up the surface and subsequently vaporize the material, or sometimes the material may fracture and flake off the surface. Different patterns can be engraved by programming the controller for the laser beam to traverse a particular path over time. The trace of the laser beam is carefully regulated to achieve a consistent removal depth of material. The benefits of this method are that it allows the engraving of very fine precision patterns on even the tiniest of items and it is a very clean technology with no harmful residues. Can you guess where are we applying this magic? We are actually engraving our logo in several items… but you will have to wait to see the end result! 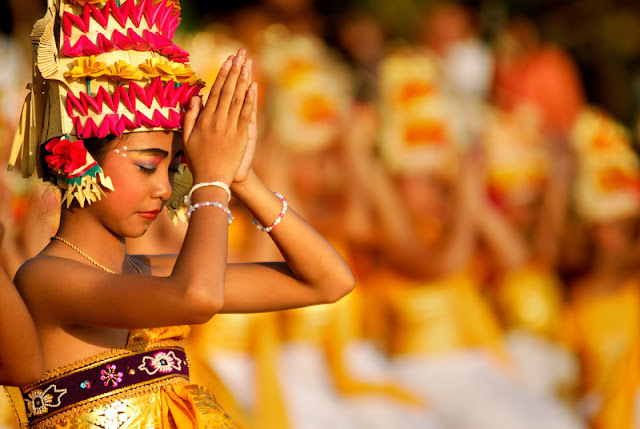 December first post is about the captivating religion of Bali. This is an very complex subject and, from my point of view, an extremely interesting one, so today I offer you just an introduction. A fascinating amalgam of native animism and Indian Hinduism splashed with Buddhist elements, the Balinese religion is followed by about 95% of the population and is the largest Hindu outpost in the world outside of India. Like the India Hinduism, Balinese Hinduism (called “Agama Hindu”) believes in the long cycle of birth, death and reincarnation of one’s soul and that rebirth continues until the spirit is freed from all desire. It also recognizes the universe as an organizing force that maintains a cosmic order in which each person, animal and object plays an integral part. To maintain the equilibrium, the Ordering Force must be kept at least as strong as the Disordering Force, both of which are constantly at battle with one another. This is the reason why every single day we are trapped in a blocked road in Bali waiting impatiently for a procession to pass by: only by the correct and timely execution of rituals, disorder – a disease, a volcanic eruption, a drought – can be made orderly again. So while we wait wondering how many ceremonies are held daily in every corner of the island, Balinese are hard at work keeping Bali in harmony with the natural forces. They believe themselves a blessed people who have been leased a magic land to cultivate it and live from it and they look upon themselves as the custodians of this “Pulau Dewata”, the Island of the Gods. Although both types of Hindus share a non-violet temperament, a sense of religious obligation and their identification with the forces of nature, Bali Hinduism is in reality too close to the earth, too animistic, to be taken as the same esoteric religious as that of the Hindus of India. Using his God-given talents, a Balinese needs only to perform daily offerings and participate actively in village and temple events. The emphasis is on the routine of ceremonies and rituals rather than on theology and on behavior and service rather than on belief. All Bali’s many gods are merely realizations from the one God, Sanghyang Widhi, the omnipotent supreme being. This deity manifests himself to man in three forms called Trisakti (the Holy Trinity): Brahma the Creator, Vishnu the Preserver and Shiva the Destroyer. The latter is seen and felt by people through suffering and sickness. Appeasing him will bring prosperity, happiness and finally liberation. Although Bali Hinduism is essentially monotheistic, the average Balinese does not utter prayers or make offerings directly to Sanghyang Widhi and none of the island’s temples is dedicated to him. Instead, in many temples there stands a three-seated pedestal enshrining the Trisakti. Before a ceremony the temple guardians decorate the pedestal with bright wraps of colored cloth: red for Brahma, white for Shiva and black for Vishnu. In the hierarchy of the divine, below Sanghyang Widhi and the Trinity, there is a multitude of other protective spirits: Dewa male and Dewi female, each closely link to nature.